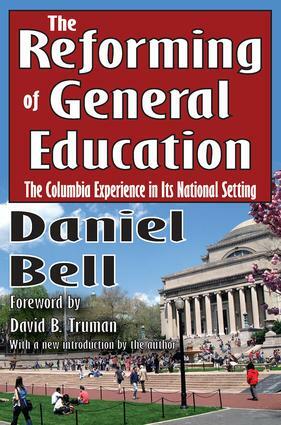 This comprehensive examination of general education by Daniel Bell scrutinizes the experiences of Columbia College, Harvard, and The College of the University of Chicago. These three basic models of general education in the country are set against a background of social change which includes a detailed analysis of structural changes in American society, the universities and the secondary schools and what Bell has called the emerging "postindustrial" society.Bell attacks the distinction between general education and specialism. He holds that one must embody and exemplify general education through disciplines and extend the context of specialism by setting it within the methodological grounds of knowledge. The common link between the two is the emphasis on conceptual inquiry. By emphasizing modes of conceptualization�"how one knows, rather than what one knows"�Bell insists that colleges can have a new, vivifying function between the pressures of the secondary and graduate schools.In his proposals for a new curriculum, Bell sets forth a scheme that imagines the first year as an acquisition of necessary historical and humanistic knowledge, the next two years as training in a discipline, and the last year, "the third-tier"�the most radical innovation�as a new kind of general education course which would "brake" specialization and apply disciplined knowledge to broad intellectual and policy questions.